Tampa City Hall is located at 315 East Kennedy Boulevard, Tampa FL 33602; phone: 813-274-8211. Photo: House at 190 Bosphorous Avenue, ca. 1927, in Davis Islands neighborhood of Tampa, Florida. Photograph by user:Wknight94, 2007, (own work) [cc-by-3.0 (http://creativecommons.org/licenses/by/3.0)], via Wikimedia Commons, accessed October, 2012. Historians almost agree on the meaning of the Native American Calusa Indian word, Tampa. Some translate it as "sticks of fire," referencing the numerous summertime lightning strikes; other claim it means "the place to gather sticks. When incorporated as a village in 1849, Tampa was home to 185 inhabitants, not including military personnel stationed at Fort Brooke. 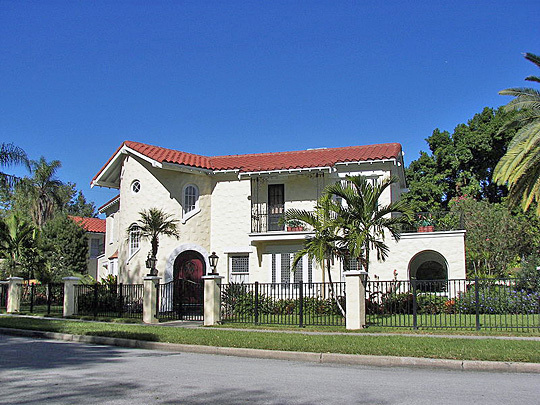 Tampa is graced with 8 National Register Historic Districts: Hampton Terrace, Hyde Park, North Franklin Street, Seminole Heights, Tampa Heights, Upper Tampa Bay Archeological District, West Tampa, and Ybor City. Many of Tampa's neighborhoods are former towns or unincorporated areas that have been annexed by the city over many years. Tampa is the metropolis of the ten or twelve counties generally known as "South Florida," and is surrounded by a country rich in resources. The city is famous as the center of the citrus fruit culture, for winter gardening, and for an immense cigar industry. The population of Tampa is estimated at more than 25 thousand and is a well-governed municipality. [In 2010 the population was approximately 335,000.] Its streetcar system is modern and up-to-date. The Tampa Bay Hotel is probably the most famous hostelry in the world, and has made Tampa one of the best known winter resorts. The hotel is surrounded by magnificent grounds kept in a high state of perfection. Tampa is noted as a winter resort and as a place of residence. Its magnificent climate has a great deal to do the healthfulness of the city. Tampa is home to many charming houses. Tampa's Sulphur Springs is a great favorite with many tourists. The city's De Soto Park is remarkable for its extraordinary forest scenery, typical of South Florida. Tampa is the leading Clear Havana cigar center of the world. Over 200,000,000 million cigars are made annually. About 9,000 people are employed in the various factories. The climatic conditions are perfect and the growth of the business has been phenomenal. S. H. Kress & Company, Views of Florida, L. H. Nelson Company, Portland Maine, 1906.